Between 1260 and 1280, the Spanish king Alfonso X El Sabo (The Wise, 1221-1284), collected more than 400 of sacred songs of The Virgin Mary. 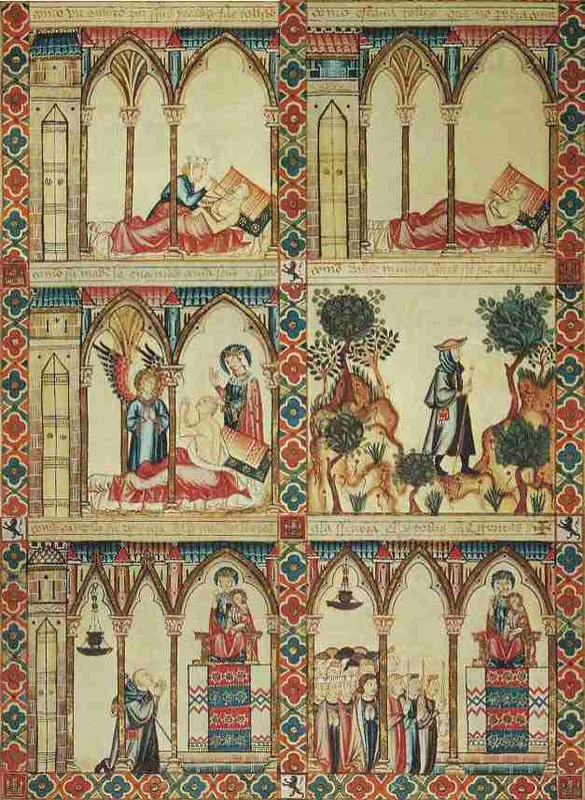 He compiled them to one of the largest collections of manuscripts: " Cantigas de Santa Maria"
All the cantigas were a tribute to the Blessed Virgin Mary and contained many miracles dedicated to Mary. Tussen 1260 en 1280 verzamelde de Spaanse koning Alfonso X El Sabo (De Wijze, 1221-1284), meer dan 400 religieuze liederen over De Heilige Maagd Maria. Hij bundelde deze tot één van de grootse collectie manuscripten:"Cantigas de Santa Maria". Alle cantigas waren een lofzang voor de Heilige Maagd Maria en bevatten vele wonderen die aan Maria werden toegeschreven. Alfonso was an educated man and and while it is doubtful that the King composed all of the songs personally, it is clear that he was closely involved, emotionally and materially, in their compilation. The cantigas (meaning 'songs') are written in Galician – Portuguese and almost all of the cantigas containes the popular form refrain-verse-refrain. 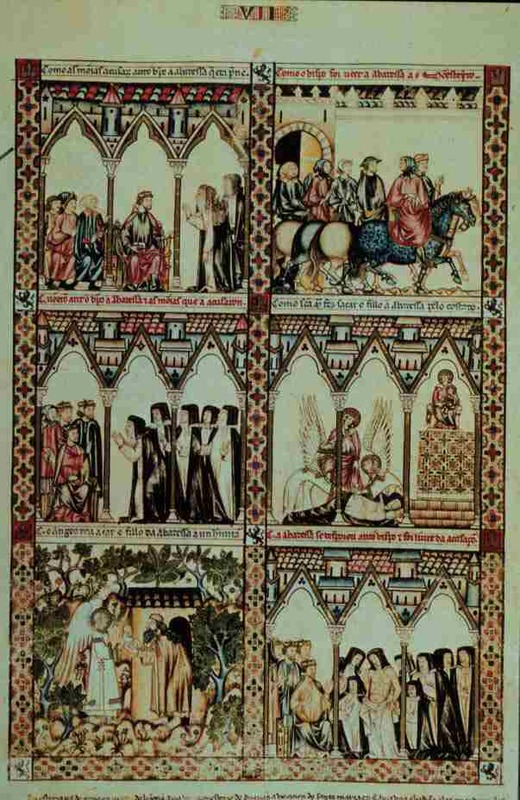 The melodies of the cantigas came from a variety of sources. 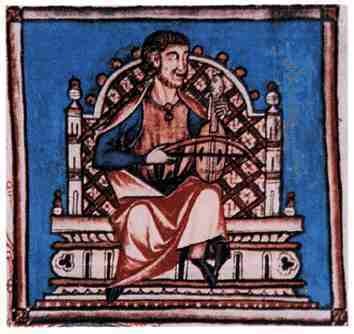 Some were adapted from sacred liturgical music or popular melodie or even with Arabic influenzes. Alfonso was een geleerde man en hoewel het dubieus is of de koning alle liederen persoonlijk heeft gecomponeerd, is het wel duidelrijk dat hij persoonlijk nauw betrokken was bij het schrijven. De cantiga's (liederen) zijn geschreven in het Gallisch-portugees en bijna alle liederen bestaan uit de populaire refrein-vers-refrein vorm. De melodieen van de cantiga's hebben diverse bronnen. Sommigen hebben melodien overgenomen vanuit de liturgie, volksmuziek of bevatten zelfs Arabische invloeden. This collection was illuminated with wonderfull images of all kinds of music instruments from different cultures. Deze collectie was verlucht met prachtige afbeeldingen van alle soorten muziekinstrumenten van verschillende culturen. e apousentar ontre bestias d'arada. ca x' é noss' avogada. The coronation of the Virgin in heaven. e de guardar seu feit' e sa besonna. quería de mal fazer, avian-lle mayça. vo sen vagar, leda e mui risonna. o fill' e criar lo mandou en Sanssonna. asleep in front of her altar weeping. may not make us go astray or sin. the Mother of God performed. you may repent and reform. Holy Mary delivered her of the child and sent it to be raised in Soissons. innocent of all their accusations. This is a story about an abbess who got pregnant. Ashamed the abbdess weeped before an altare en fell asleep. The Virgin appears and take away the child. When the abbess woke, she discovered she was no longer pregnant. Dit is een verhaal over een abdis die zwanger raakte. Beschaamd over haar toestand viel zij huilend voor een altaar in slaap, De Maagd Maria verscheen en nam het kindje weg van haar. Toen de abdis wakker werd, ontdekte ze dat ze niet langer zwanger was. do departimento que á entre Ave e Eva. e Maria britou as portas per Ave.
For Eva took us away from heaven and from God, Ave puts us back there. broke open the doors with Ave.
era Deus e nos guia. to God and thou our guide be. "Santa Maria Strela do Dia" vertelt ons dat de Heilige Maagd onze gids is en iemand om ons aan te spiegelen. Ze laat ons de weg naar het paradijs zien. Esta [é] como Santa Maria guareceu un ome que era tolleito do corpo e dos nenbros, na sa eigreja en Salas. que non ouv' y outros preitos. os pes d' andar desafeitos. Because of his sinful life a man lies bedridden for 5 years. His suffering is so great that he promisses to make a pilgrimage to Salas if he should get well, and donate a pounds of candle wax. He gets well right away and makes the pilgrimage. His limbs hurt no more, except his feet from walking. Let us say thanks to Maria, as she delivers the sick from illness and pain. Vanwege zijn vele zonden ligt een man al vijf jaar ziek op bed. Zijn lijden is zo groot dat hij beloofd een pelgimstocht naar Salas te maken als hij weer gezond wordt. Hij doneert een pond kaarsvet. Dan wordt de man beter. Zijn ledematen doen niet meer zeer, behalve zijn voeten van het lopen. Laten we Maria danken, dat zij zieken bevrijdt van ziekte en pijn. per que gran mester ajuda. e mui gran gente miuda. fora dos muros todo per força fillavan. e dos santos, e dos mouros foi viuda. que fogindo non avia niun redea teuda. of another faith and disbelievers. for a king who was then its ruler. he was in great need of assistance from anyone who could give it to him. crossed a large river called Morabe with many knights and a great army of foot soldiers. They ran toward the gates of the city and all they found outside the walls they took by force. with the other king and to order the banner of the Holy Virgin Mary taken out of the city and to doubt not that he wuld defeat the enemy at once as soon as he had unfurled it. Furthermore, they advised him to have the Christian congregation go out with the crosses from the church. and saints and it was seen by the Moors . on the other side, they were so alarmed by it that although it was a powerful army, all were soon defeated. And they lost the tents they had brought and everything else. Many people of that ugly bearded crew died there. they had lost all they had brought there, such geat fright of the banner and the crosses seized them that none of them drew back on the reins as they fled. Her mercy made manifest to all. In the city of Marrakesch, an miracle was happening dedicated to The Virgin Mary. She helps a devote King in his dangerous war against an other King. Como Santa Maria fez en Son Johan de Leteran en Roma que se mudasse ha sa omagen da a parede da ygreja na outra. que no-lo demo non faça desasperar. mais d' outra cousa senpre servir e loar. que ss' y foi mãefestar. ca ben cuidava por ela perdon gãar. que fezera, e sobr' aquesto cuidou. e a Virgen a oyu. t' á parcida a Sennor que nos manten. que fez a Virgen sen par. gualardõado u nunca verá pesar.